Vendor Managed Inventory (VMI) is a program where the vendor manages the level of inventory at the customer’s inventory locations. The vendor is responsible for analyzing and optimizing the inventory flow for each of the customers they are in a VMI relationship with. Information on inventory levels and sales data is shared between the two partners electronically. Need more information on Vendor Managed Inventory? 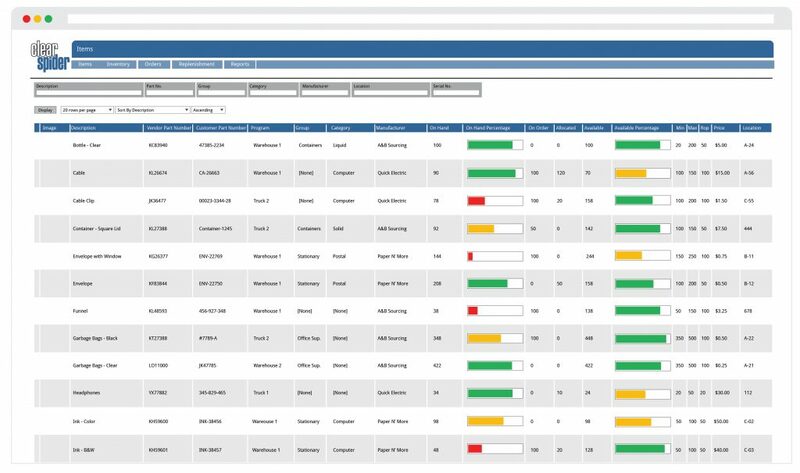 From the vendor’s perspective, Clear Spider allows them to track inventory levels using minimums, maximums, and reorder points. These indicators will notify vendors when the customer’s inventory falls below the preset levels and an order needs to be placed. Vendors are able to track inventory through a variety of reports and live data, allowing them to improve delivery times and more accurately forecast customer demand. In addition, vendors can create purchase orders, print barcodes, run inventory reports and more. Clear Spider helps to simplify and ensure accuracy in the order process. Clear Spider makes VMI possible by allowing vendors and customers access to the same system. Both parties can update and view the system on their own time, making data translation seamless. Clear Spider also allows these permissions to be customized for each party so they only have access to the features necessary for their operations. This allows companies to maintain organizational security, while still allowing for easy and open communication. Vendors can monitor their customer’s inventory and sales levels to avoid under or over stocking. VMI gives vendors more control over the inventory process and alleviates the customer of some associated responsibilities and costs. Both parties benefit when vendors can focus more on improving inefficiencies, creating lean manufacturing, and achieving seamless deliveries. Managing stock is a difficult task, and when customers use multiple vendors it can be easy to lose track of inventory levels. Giving vendors the responsibility of managing inventory levels benefits both the customer and vendor. Clear Spider’s VMI system is versatile and can be used by both vendors and their customers. Vendors can give their customers access to the Clear Spider system with preset permissions to view or edit inventory. Vendors can automate integration with their customers’ ERP, POS or inventory systems if required. In addition, both vendors and their customers are able to view when inventory levels are low, what stock has been shipped and when deliveries are expected to arrive. 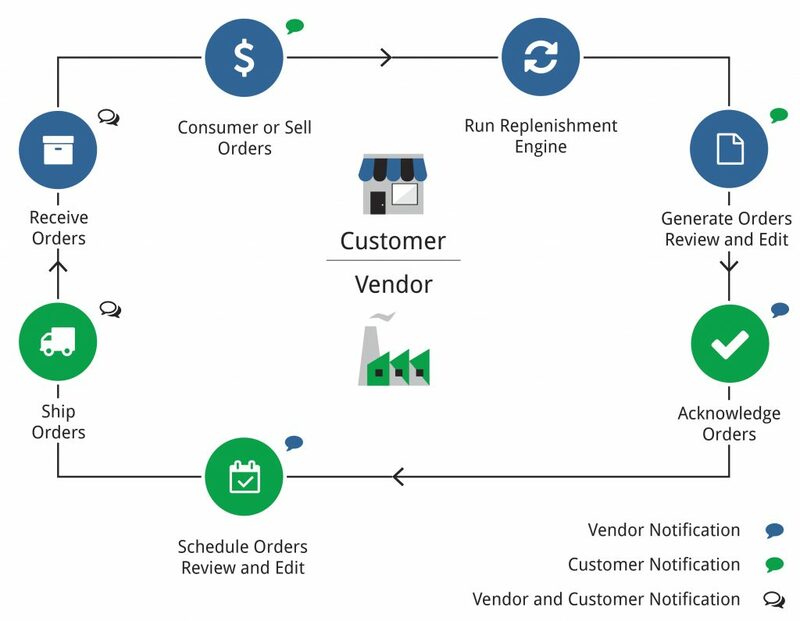 Below is an example of what the process flow for a vendor managed inventory system could look like. With the Clear Spider system, additional steps can be added or taken away depending on individual business needs. The system’s re-plan engine produces automatic purchase orders based on reorder points, minimum and maximum quantities, and consumption. System-generated purchase orders will be created with the appropriate quantities to bring customers back up to their desired stock levels. Automatic replenishment helps to reduce stock shortages and ensure that orders are always placed on time. With Clear Spider you have the option to integrate barcode or RFID scanners to simplify the data entry process. If you don’t already have scanners in place, we can help you select the right technology for your operations. You can either use barcodes that are already on your items, or print custom labels using the Clear Spider system. These capabilities make organizing and maintaining inventory a hassle-free process. Fulfillment encompasses all of the processes that take a product from the vendor to their customers. Clear Spider’s fulfillment capabilities include: order generation, acknowledgement, print, pack, ship, bill, receive, and unit of measure conversion. We can also customize the system further for capabilities that are unique to your organization, such as consignment storage. Clear Spider is a customizable platform built on ASP.net, Microsoft’s web application framework. A customizable system like Clear Spider gives you the ability to have your inventory system match your inventory processes. The Clear Spider workflow engine deals with the process used in order management. You can customize the specifics of each stage, along with the order they are completed in. This allows Clear Spider to accommodate any level of supply chain complexity, and help you ensure each step is completed along the way. With Clear Spider, you can import large amounts of data into the system using Excel spreadsheets. The template to do this will be provided to you during the setup phase of implementation to upload your initial SKUs. The template can also be used for mass updates, rather than manually editing individual items. This makes it simple for your organization to keep information up to date, even when large scale updates are required. Clear Spider offers a variety of customizable SQL based reports that can be exported to Excel and XML formats. Some examples include billing history, order history, planned inventory, tracking number, and item reports. These reports help vendors better monitor system performance and track historical data and trends. Users in the Clear Spider system can be granted different levels of access based on operational needs. For example, using role-based permissions can limit your customers or vendors to only viewing inventories at their locations, keeping inventories private and only accessible to the appropriate users. Any degree of visibility is possible – it all depends on what your business needs are.